Yiddish Theatre: genre-blurring, feminist, forgotten? ‘It’s a classic of Yiddish theatre,’ I was told when the script of David Pinski’s 1906 tragicomedy, Treasure, was thrust into my hands. I nodded breezily, but as soon as the meeting was over, I turned to Wikipedia. A classic of… what? That question started me off on a fascinating journey of discovery into a lost world of playwrights who were as political as they were prolific, plays that are rebellious as they are occasionally raunchy, and characters who are as warm-hearted as they are outrageous. It was a journey on which I travelled back in time to the Jewish villages, or shtetls, of rural Russia, but which also, surprisingly, led somewhere a little less exotic: East London’s Commercial Road, which was just as much a thriving hub of early twentieth century Yiddish theatre as Warsaw or Krakow. So, first of all, what is Yiddish? It’s a thousand-year-old language, historically spoken by Jews across Eastern Europe and Russia; in 1939, it was the tongue of an estimated 13 million people. And Yiddish theatre? It’s a much newer phenomenon. It didn’t exist before 1876, when it began, in humble style, in a Romanian beer garden, with a couple of amateur actors taking on an ambitious new play by a young writer called Avrom Goldfaden. From these lowly beginnings, the genre flourished, becoming enormously popular across Eastern Europe before crossing oceans to take New York, Buenos Aires and even Sydney by storm. Yiddish theatre’s journey from Belarus’ village barns to Broadway was catalysed by the Russian government’s treatment of its Jewish population, who were hounded from their homes in a series of brutal pogroms. Those who were forced to flee often didn’t even have time to grab their clothes, but what they did manage to bring with them was their culture, especially their theatre. Amongst the 150,000 Russian Jewish refugees who emigrated to London at the turn of the 20th century, there were actors, impresarios, playwrights and designers with a real appetite for keeping Yiddish theatre alive. In Yiddish theatre’s heyday, shows were so popular that queues were famously long, snaking all the way down the street. Punters with packed teas of fish and bagels stood for hours in all weathers, waiting to get a ticket, and there would be screeches of outrage when anyone tried to jump the queue. Should an actor forget a line, audiences would shout to supply it, and there would always be a running commentary from the gallery on the plot from some know-it-all who’d seen the show before. Twenty audience members would squash onto rickety wooden benches that would have been a squeeze with ten. Yiddish theatre brought the Jewish East End community together, in celebration, in laughter, and sometimes in criticism. The plays themselves were based on folklore and myth, and Shakespeare, translated into Yiddish, was also a popular choice, but you could also see a lot of new plays that explored the joys and challenges of making a life in a new country. There was even a saying to describe Yiddish-speaking audiences’ enthusiasm for the shows they crammed in to see: they ate broyt mit teater – their bread with theatre. Buttering this bread were the legendary stories about the personal lives of the Yiddish theatres actor-managers. The shows’ stars had cult status amongst East End communities; a ‘name’ would sell out shows for months, if not years, on end, and what those ‘names’ got up to once the curtain had come down would keep gossip circulating from theatre stalls to market stalls and back again. So, if London’s got such a rich history of Yiddish theatre, why haven’t we heard more about it? It’s partly to do with the fact that Yiddish was an immigrant language, and as first-generation immigrants died, younger generations were often not keen to keep the language – with its redolence, especially after the Second World War, of a tragic history – alive. Anti-Semitism, too, played a part in Yiddish’s demise. And why are we so excited about bringing Yiddish theatre back to the London stage? Well, for a start, it’s fearless and hilariously self-critical: no-one’s too grand to escape a merciless character assassination, and every pretension and self-deceit is torn apart. Yiddish theatre is heartfelt, inclusive and universal. Treasure, like so many Yiddish plays, defies genre – it slips between naturalism and expressionism, tragedy and comedy in the space of a moment. And as our production of David Pinski’s Treasure, in a new English translation by Colin Chambers proves, Yiddish theatre is a genre that’s surprisingly feminist. Yiddish theatre embraces women’s rights and sexual freedom. It’s full of examples of bold, combative women who refuse to accept the path that convention’s laid out for them. For example, Sholom Asch’s God of Vengeance, written in 1918, tells the story of the daughter of a brothel owner who falls in love with one of her father’s prostitutes. They kiss passionately, on stage, and then elope together. This show toured, without comment, round Eastern Europe for several years. The first night it was put on in Broadway, in 1923, the entire company of actors was arrested the next day and the show lambasted for its immoral content. And then, of course, there’s Jacob Gordin’s muscular family saga, Mirele Efros, often called the Jewish Queen Lear, in which a powerful matriarch’s authority is challenged by her daughter-in-law. The title character has not inherited her empire, as Shakespeare’s Lear does, but has built it herself through hard graft. When she’s ousted, she puts up a raw, savage fight, reasoning, shouting and cursing at full throttle. Even in plays which, more conventionally, have male storylines at their heart, the female characters don’t give the male protagonists an easy ride. In Gordin’s powerful, Faustus-like moral fable God, Man and Devil, the female characters’ journeys are given scope, compassionate treatment, and, above all, an honest and non-judgmental interest. So Yiddish theatre’s fearless and feminist, but it’s also special because of the radical politics that underpin so many of its plays. David Pinski, the writer of Treasure, was a socialist who was strongly involved in trade union activity on his emigration to the United States – amongst other high-powered roles, he was president of the Jewish National Workers’ Alliance – and what we’ve been discovering in rehearsals is that a left-leaning, radical, subversive consciousness is right at the heart of this bittersweet comedy. So Yiddish theatre captures a culture – and a generation – on the cusp of radical social change, and it brought these revolutionary ideas all the way from Eastern Europe to the East End of London, influencing in their turn the East End’s socialist activists of the 20s and 30s. In the first fifty years of the twentieth century, Yiddish theatre made a huge contribution to the life of the East End – both cultural, and, indirectly, political. 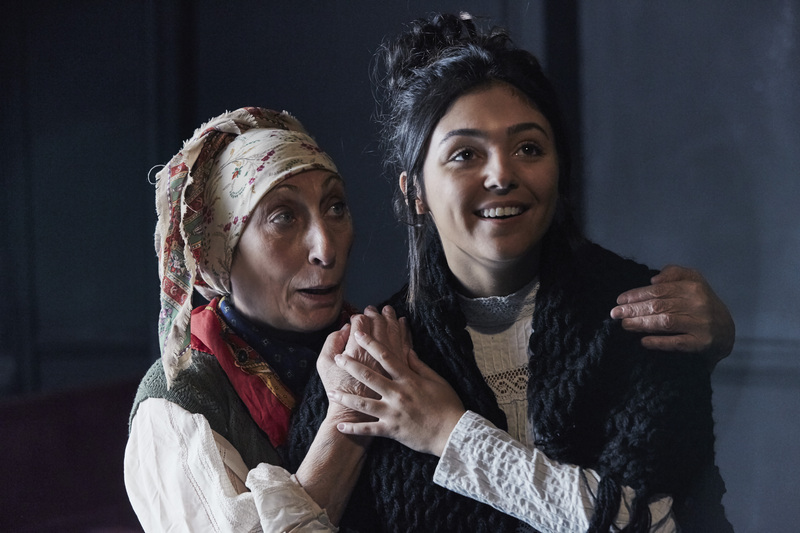 And though it may be largely forgotten now, the success of Yiddish theatre is a timely reminder of the energy and creativity that refugees brought to London’s cultural scene.